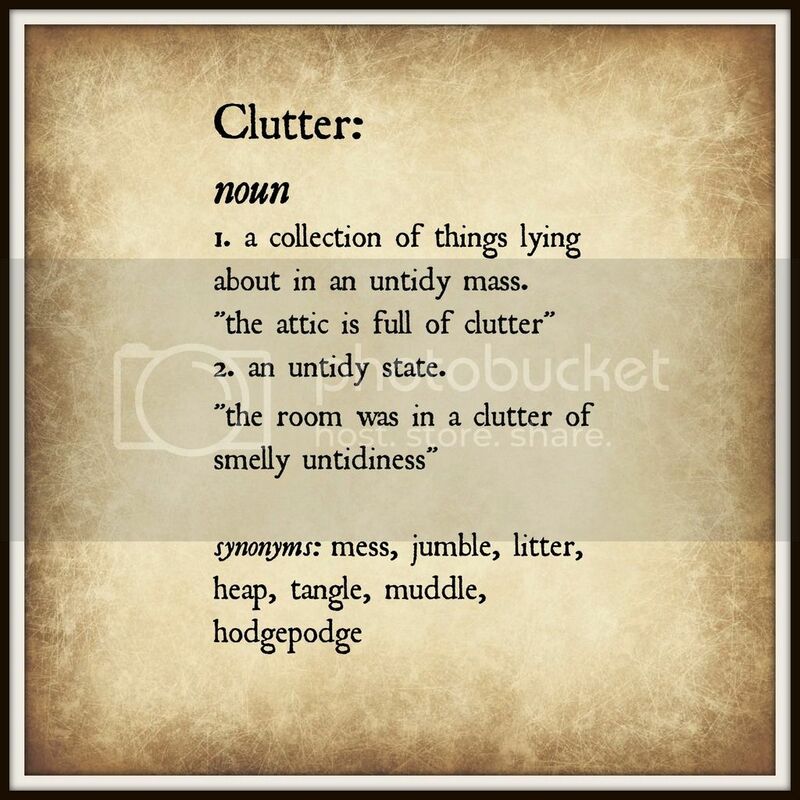 By this definition and according to many visitors, my house is not necessarily messy or cluttered. Yet to me it is a currently in an unlivable state. It makes me nervous to have any amount of clutter, and just knowing that my basement is full of unneeded items to be donated makes me constantly anxious. I dread going down there. This means it's time to de-clutter and sort our house again. Even when things look tidy to me, I usually need to re-sort and find new ways to store our belongings. It makes me happy to organize. But this time it definitely needs to be more than just organized; I need and am determined to let go of more things. It's not that I can't let go of stuff - I'm actually almost too good at it. I get over zealous about the process sometimes and regret what was given away, or worse my family regrets what was given away. I need to think through my donations in a less desperate and anxious mood. During our last major clean out in 2014, I became over whelmed by the tasks and eventually fizzled out before completing them all. Some of the items were eventually finished in 2015 as a necessity. Amber's playroom still had too many toys for the couch and TV she desperately wanted. We bought new towels and bed linens, but all the linen closets were full. 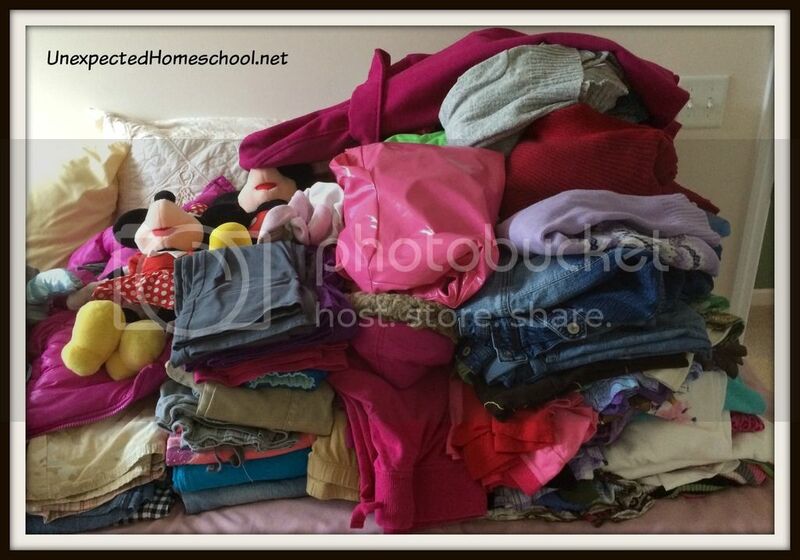 Those were semi-stressful de-cluttering and cleaning tasks because of the hurried nature. Still I was pleased with the end result, if not the stress. Sigh... one pile of clothes. And it's only Amber's most recent items. This year I've made a detailed list of areas I want to sort, straighten, de-clutter, clean, and generally deal with the current mess. But unlike last time where I listed the basement as a single cleaning job, I'm being very specific with my tasks. Instead of writing "basement" on the list and then feeling defeated because I never finished the whole thing, I'm detailing the specific areas to be sorted. For example: tall bookshelf, craft bins, decoration bins, Amber's stored toys, and so forth. This allows me to target the area to tackle each time I'm working and not lose my focus. There is also the added bonus of creating smaller jobs that take only a few minutes each. Even if I just have 15 minutes while Amber does her workout on our recumbent bike, I can still sort a bin or two and mark them off the list. Already this week I've sorted three locations when I didn't expect to have time for any de-cluttering. Our basement is currently even messier than before the process started since the results of my tidying and de-cluttering have gone to the basement in organized piles. Each charity or store that will be receiving our unneeded items has a specific location in the basement. This way when we are heading out near those donation spots I can grab what currently is ready to be donated. So far this plan is working as well as hoped. The de-cluttering process is going slower than I'd like, but tasks are actually being completed. Here's to hoping I can soon finish my ever growing list of tasks for a mess and clutter free 2016. Great M word. I am at a loss for what I am going to write about this week. I hope you get the mess sorted so you can feel more comfortable. I decluttered and got rid of a lot of mess last year, but I need to come up with a system to keep up with the stuff that's accumulated since then. I really like your idea of making a list of specific tasks/areas to conquer. I'd feel such a sense of accomplishment when I could mark off an area as complete. Good luck!! My goal this year is to do one drawer/closet/cabinet/whatever a day. If I wrote it all down, I think I'd be overwhelmed, so I'm just going with one spot at a time. So far, I've worked through three dressers and a bathroom...slow and steady, right? Great goal! I tend to be a neat freak so our home is *usually* tidy but I need to spend more time going through areas and purging. I shouldn't hang on to so many things/ clothes/ junk items that we don't use regularly. Great job! Decluttering is such a cumbersome job, but it feels so good after it's done!